Who will be in line for the government’s £100m urban broadband handout should be known next month when the department of culture media and sport (DCMS) finalises its criteria. However, residents of the six cities in addition to London, Edinburgh, Cardiff and Belfast should be getting broadband at 80-100Mbps before 2015, a DCMS spokesman says. “It is not possible to say in advance of receiving the plans from each of the cities exactly when this will happen in each city,” he told Br0kenTeleph0ne. He could not say how many homes and businesses would be served. “However, in supporting this initiative, BT and Virgin Media have committed to strengthening their networks in the winning cities and will be offering their broadband services with 80-100 Mbps potential, rather than 24Mbps,” he said. DCMS has just confirmed that the £100m is in fact new money for broadband. “The £100m is not coming from the BDUK fund. It is money the chancellor has provided specifically for urban broadband and there will be no impact on the speed or scale of rural broadband rollout,” it said. The government today confirmed a Br0kenTeleph0n3 report in July that BDUK planned to support the roll-out of high speed broadband networks in cities. Chancellor George Osborne said Edinburgh, Belfast, Cardiff and London will be the first to receive a cut of the £100m the government has set aside for urban networks running at 80-100Mbps. Cities and towns across the country will compete for up to six more pay-outs. Ofcom also announced a consultation on allowing new telegraph poles to carry high speed broadband. The closing date is 21 February 2012. DCMS published advice to local authorities and communications services providers about microtrenching to carry ducting for high speed broadband. The moves are part of the government’s national infrastructure development plan to kick start the economy and prevent it from slipping into recession. Again. 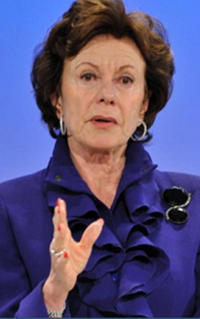 Incumbent telcos should not be allowed to continue to charge excessive prices for their copper networks while they refuse to build fibre networks, would-be competitors told Europe’s Digital Agenda champion Neelie Kroes . Kroes opened the European Competitive Telecommunication Association (Ecta) annual regulatory conference earlier today. She is leading a European Commission consultation into funding of high speed broadband networks. One of its proposals is to allow incumbent telcos to increase the prices they charge for copper-based services in order to fund fibre roll-out. Ecta chairman Tom Ruhan told Kroes that the extra profits telcos make from “excessive cooper pricing” has not led to incumbents installing fibre. Instead the excess profits are being distributed as dividends to shareholders and used to invest in non-European businesses, he said. His comments are grounded in a study commissioned by Ecta from WiK, a German consultancy, and reported in April. This found that wholesale charges in some countries are double the amount that it actually cost incumbent operators to build the networks decades ago. Ruhan said there is no justification for paying more than the real cost of copper networks, when incumbents are failing to invest in new high speed infrastructure. He called for any profits incumbent telcos make from overcharging to be put into a general fund that all network operators can use to build fibre networks in that country. “Dominant operators that receive excess profits from their legacy networks … should pay the money back by reducing charges on high speed fibre networks. Alternatively, the money could be channelled into a fund available for other potential investors in open fibre networks,” he said. WiK found that regulators had allowed incumbents to base their cooper prices on current replacement costs rather than historic costs, ie to ‘sweat their assets’. This meant there was no incentive for them to invest in fibre. Wik found that incumbents had invested in fibre only when faced with serious competition, mainly from cable TV companies. The commission’s consultation on wholesale charging methods ends 28 November. The commission is expected to produce a recommendation in 2012. Br0kenTeleph0n3 is hearing that there have been changes at DCMS. Apparently former broadband policy supremo Kate McGavin is to write the draft Green Paper that will kick of the process of developing the new Communications Act, expected some time towards 2015. The bad news is that the deadline for the Green Paper has slipped to the end of January. Into her place comes a Stephen Hodgson. If this is the same person Google identifies as head of DCMS’s elite sports interests in 2003, then he should be well qualified to deal with super-sized egos, inflated money expectations and outrageous side demands, not that these are part of next generation broadband procurement in the UK. His experience of policy development related to broadband is unknown. A DCMS spokesman confirmed the Green Paper will come out next year, but said he wouldn’t confirm or deny the new appointments or responsibilities. The department would publish a new organogram on 30 November, he said. Geo Networks and earlier, Vtesse Networks, abandoned plans to provide high speed broadband to rural communities and other not-spots because they faced a break-even period twice that of BT’s. This is due to restrictions tolerated by communications regulator Ofcom on BT’s Physical Infrastructure Access (PIA) product, expected to be formally launched this month, that exclude at least half the potential revenue from would-be tenants. Despite trials with Fujitsu to provide fibre to the home in Wales via BT’s poles and ducts, the restrictions are expected to leave BT’s monopoly in some two-thirds of the geographic UK intact, and to ensure that few if any residents receive broadband speeds greater than 24Mbps. The restrictions are a ban on traffic aggregation, which excludes the village ‘digital pump’ idea, a ban on selling leased lines, which excludes local businesses and public sector customers, and a ban on selling backhaul, which excludes customers such as mobile and satellite network operators. These bans restrict PIA tenants to providing services to residential customers for the part of the network between the local exchange or street cabinet and the home. Geo Networks’ CEO Chris Smedley estimates that these restrictions exclude tenants from 50% and 60% of the potential revenue stream in rural areas while allowing BT access to the entire stream. This reduction pushes tenants’ potential break-even period to 20 to 25 years. This is double BT’s expected break-even period for its Infinity fibre to the cabinet programme. BT has none of these restrictions. According to Bill Murphy, the man in charge of BT’s next generation access programme, Infinity will break even in 10 to 12 years, while Openreach’s general manager for next generation roll-out Kevin McNulty says BT can break even in 12 to 14 years with just a 20% uptake. Smedley says he has patient shareholders and capital lenders. But none is prepared to wait 25 years for a return, especially when BT can fund a competitive offer from cashflow in a market where in many cases it is already the monopoly supplier. Geo Networks was a credible competitor to BT, and would remain so if the PIA restrictions were removed. Smedley says it has the country’s newest national fibre network, and carries two-thirds of the country’s internet traffic, thanks to deals with banks, mobile operators and ISPs. Extending the Geo network into rural communities could be done at marginal cost, if Ofcom removes the restrictions. We don’t know what persuaded Ofcom that allowing the restrictions was the right thing to do. However, if it was to protect BT in fulfilling its universal service obligation, Ofcom may have acted against BT’s wishes. If that was BT saying it was prepared to compete on a level playing field, then Ofcom has questions to answer on one of its main roles, which is to promote competition in communications markets. Many who read this blog may feel that they have been left in the dark over decisions related to the procurement of high speed broadband in Britain, if only because some of the announced decisions appear to fly in the face of common sense. The Information Commissioner’s Office is now inviting the public to tell it what information public authorities should release proactively. The survey is intended as a supplement to Freedom of Information Act requests, and to short-circuit the time-consuming rigmarole of the FOIA process. If BT wants to blow it’s own trumpet, now is the time. It has faced a serious threat to its hegemony of the British communications market, and won. This week Geo Networks became the latest competitor to exit the crucial middle mile market, following Vtesse back into the corporate market. Br0kenTeleph0n3 will have more to say on this later. In addition, Cable & Wireless Worldwide wrote off more than £460m in goodwill, destroying its balance sheet and crippling its ability to fund a competitive offer to BT. Fujitsu, once so vociferous in condemning BT’s prices for physical infrastructure access, is now the first to use BT’s poles and ducts to fibre up homes. Other competitors are small, weak, disorganised and scattered. With voice and broadband prices in decline, no bank in its right mind would lend to them. None has the weight to get useful deals with content providers. State, i.e. BDUK money will go to firms with turnovers of £50m a year. Game, set and championship to BT. But how was the match lost? On the basis that we should look at what people do rather than what they say if we are to discover their true goals, the DCMS’s web page for press releases should offer some suggestions. These reveal that DCMS’s main preoccupations these days are the Olympics and to prevent the export of bits of art. The most recent mention of long term matters is on 14 September, which is about using taxpayers’ money to extend “superfast” broadband in Suffolk and Rutland, both of which will depend on BT. Which begs the question, what is it based on? Wherever BT has been threatened by competition (Erbistock, Ewhurst, Iwade, Cornwall…) it has responded with alacrity. The one exception has been with the cable tv network, but even there BT’s Infinity roll-out largely mirrors Virgin Media’s network for competitive reasons. One could say the market, as expressed by the level of competition from, not to, BT, has worked extremely well. The more competition BT faces the more pro-active it is. This lesson has been lost or hidden from DCMS. It has been in BT’s interest to disguise or hide the lesson by tolerating weak competition where it cannot avoid it, and to be ruthless in destroying competition where it faces the loss of its monopoly. In this it has done a brilliant job. The future of the national communications infrastructure is no longer on the DCMS agenda, or rather, it is safely in BT’s hands. Britain has enough money to build the best broadband in Europe, but vested interests and red tape are stopping progress. That’s the conclusion drawn by Eurim, a policy think tank, following hearings to find synergies between the nation’s broadband and smart metering network programmes. A report on the meeting published yesterday said the money needed to build the energy companies’ smart grid ranged between £1bn and £4.5bn, a sum that “dwarfed” the £530m given to BDUK to ensure that “the final third” of UK residents will get high speed broadband. These sums did not take into account potential savings from pooling spend on public service networks, sharing existing infrastructures and mixing technologies and business models according to local needs, provided the barriers are removed, Eurim said. “UK targets for 2015 (minimum 2Mbps for 90% of homes) are modest compared to what could be achieved if currently agreed public funding and that available from industry were joined up, regulatory and planning obstacles removed, and 4G spectrum made available at the same time as the rest of Europe,” Eurim said. The availability of broadband was already a standard solicitor’s question for domestic property transactions, it said. Lack of access to high speed broadband could wipe hundreds of thousands of pounds off the value of commercial properties. This helped make it the top priority for the economic development teams of many councils. Eurim said the obstacles to joining up the smart grid and broadband networks were mainly regulatory and legal and to do with conflicting business interests and models rather than underlying technology. “The more dynamic the market (with genuine competition between varied and evolving service offerings) the (more) important the need for ‘open’ standards to enable inter-operability and choice,” it said.